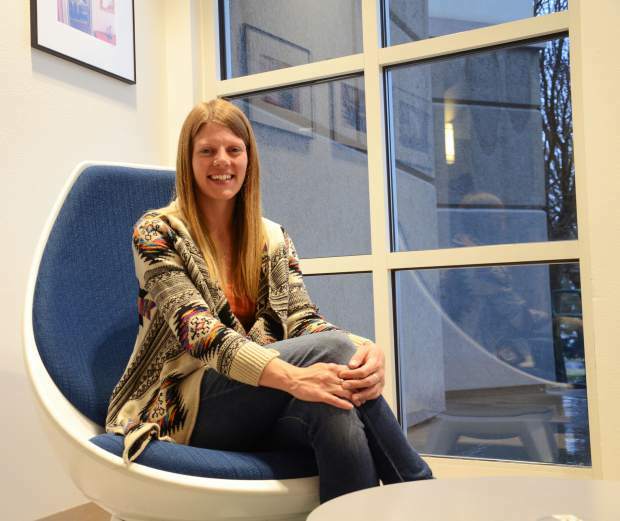 Janell Togno is a student in the sustainability studies program at Colorado Mountain College. One of her projects is to try to convince the city of Glenwood Springs to ban plastic grocery bags in town, same as Carbondale and Aspen have done. While on a hike last Wednesday, Janell Togno picked up two plastic bags that were littered on the side of a riverbank at a popular tourist destination in Glenwood Springs. She says she often sees plastic bags and other trash littered at Two Rivers Park, but now that the river is low, they’re especially easy to spot. That’s part of the reason the Colorado Mountain College student is spearheading an initiative as part of her sustainability program studies that would gather community support for a citywide ban on plastic grocery bags in Glenwood Springs. “How do I as a citizen take my passion and turn it into change?” asked Togno, a second-year student at the local community college. “If we wait for legislation for change we might be waiting for a long time,” she added. Togno is the first person in the city to start an initiative like this, according to Jonathan Godes, a city council member and 10-year resident of Glenwood Springs. Although neighboring Carbondale and Aspen have already banned plastic bags, Glenwood Springs City Council has never been asked to vote on such an ordinance. “I would have to see the community come forward and say that this is a large priority for them before I would be enthusiastically supportive of this or any other initiative otherwise,” said Godes. Togno says she’s grappling with the idea that the city’s government and citizens are preoccupied with more pressing issues like construction associated with the new Grand Avenue Bridge downtown and the development of South Canyon’s recreational area. But she hopes for some support from the community because, she says, the current overuse of plastic bags is not sustainable long-term. “The big misconception is that people think plastic bags are recyclable, and they’re not,” said Mike Hinkley, the district manager at Mountain Waste & Recycling, an organization that offers trash removal and recycling in the Roaring Fork Valley. “Not only are they hard on our recyclable MRF [materials recovery facility], but they release dangerous chemicals,” he said. Hinkley is referring to a special facility that takes all recyclables and separates them using a combination of machinery and manual labor. Although plastic bags aren’t recyclable, they sometimes end up in their recycling. “Eight times out of ten, drivers are able to intercept plastic bags that are thrown into the garbage,” said Hinkley. But sometimes they slip through that diversion process and arrive at the materials recovery facility, tacking on ample, additional costs. Once there, “they then go through a conveyer belt system, and whenever they go into that system, they bind up some of the processes and shut down some of the machinery,” Hinkley added. Togno met with council member Godes on Wednesday and plans to continue meeting with other City Council members in the coming weeks. Her next steps include visiting other communities that have already implemented plastic bag bans. She hopes to learn from others who were able to persuade their communities to join the cause and to gain insight on how such communities adjusted after the ban. “Nobody really takes me seriously, but I’m going to keep doing what I have to do,” Togno said, adding that plastic bags are only one small part of the problem; it’s just easiest to tackle first. She says a river valley especially needs to protect its water supply and not just portions of it. Reindel agreed saying most coastal cities vote to ban plastic bags. “Everybody should start packing their own bags,” said King Lloyd, manager of the city’s landfill and recycling center. “Why does it have to take policy makers to make us good citizens? We should be able to take the initiative on our own,” he added. Reindel says Glenwood residents should support this transition because it not only affects our environment and wildlife but it also affects us all directly. “Plastic never breaks down. It only breaks down into smaller pieces,” which causes bioaccumulation, she said. “That means that little bits of plastic end up in our soil and waterways, smaller animals ingest that, and eventually it works its way up the food chain,” Reindel said. Togno’s project is due at the end of the academic semester in May, but she plans to continue working on the task long after its deadline.